Eleven excellent tracks on a debut album from 1996 but no success story, so what is the story? Send No Flowers were snapped up and studio bound. They had songs, by god, superb compositions, and numbers that were the equal of prominent American counterparts of the day, Stone Temple Pilots were mentioned in comparison, as were Alice In Chains. The album kicks off with the sublime Effervescent Smile. A noisy rush of the instruments and we are into the verse, vocal surges and querulous guitar back finally into the chorus. The lyrics are comic, absurd, in contrast to a rich tune. The guitar echoes, sinks, rises and sinks again, hankering on its own of some old ITC television detective series. 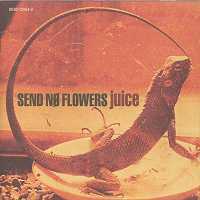 Send No Flowers wrote songs that took circuitous journeys yet somehow always found their way home. The songs never bored nor got too big. Fireman is as 'showcase' as it gets, constantly changing, with a rightful showing off on the guitars. It is a seven minute, 53 second epic, but is not undeserving of the time taken out playing or listening. It takes as long as is needed to tell the tune. Monotony became the principle song on the first four-track EP in 1995 and is another clever barnstormer. The theme of repetition is cast respectively on verse and chorus in rolling guitars and a shouted sentence. Meanwhile something more interesting was happening as the vocals swam and swooned underneath the assault with only the briefest of easing guitar links between verse and chorus. 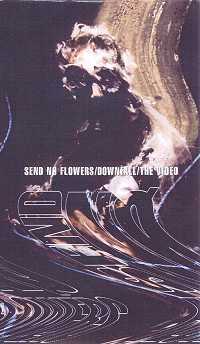 Downfall was a rollicking, rabble-rousing track that became the 1996 single and video. Animal Feeder was the closest they came to Pearl Jam, a subtle album closer, while other standout tracks included Porcelain and Sepia, though mystifyingly there was not one dud or drab number or note in the 11. So few long players can please beginning to end, but Juice does. How could they go so quickly belly up? The answer is two-fold. They toured and they were British. Like any band with a chance they toured to get their sound around. Unfortunately, they did not quite gel live, like they had one band member too many. The instruments seemed to reject one another. They repeatedly blamed the sound technicians, but at three different venues to my own witness and when the audience weren't taking it, and rock audiences don't like to hear excuses, vocalist Matt Bradbury misjudged the level of rock strop he should level at them. Bradbury was finding his feet but was impatient and the audiences weren't for his band, but for the groups they were supporting. Live they could not match the perfection of the engineering of Sank and Paul Johnson. Had they mastered the live performance then they would then have been up against a kindergarten audience of rock youngsters who were already consigning most of the grunge acts that rescued rock to the same hinterland as the soft-rockers that preceded them. The rock kids wanted only listen to the next big thing from America, anything but rock in fact, Gwen Stefani and Fred Durst were their new heroes, if only they could have settled for sexual confusion. The moment that rock kids got wind of the fact that a band was British they were doomed. East West and their Warner distributors obviously sought quick results on their investment and with no significant, immediate returns Send No Flowers were dropped amidst the usual disputes. Support for another year and a second album may have increased their chances some. Instead, they are left to stand as one of the greatest, rarely heard or considered albums in rock. Bradbury was a great lyricist. Steve Rendell co-wrote all the songs and bass player Dom Gearon co-wrote most while second guitarist Scott Leach had notable input into some of their greatest songs. On drums simply getting on with it was Thomas Broman. Another problem may have become evident when I gifted them of a seven-inch vinyl by a short-lived Goth band of the same name suggesting that they make an ashtray out of it. They seemed genuinely pained at the discovery. "Oh, not again!" They had apparently begun musical life as Agent Orange before discovering that a band of the name already existed. It was shortly after that they parted company with East West beginning again under a dreadful new moniker, Shinola, producing a seven-inch vinyl of their own. The story ended there. For anyone familiar with Jilly's Rockworld in Manchester during the remainder of the 1990s wondering who the faces painted on the wall were, well, at least five of the six were Send No Flowers, a stab at immortalisation. It wasn't to be the lucky gesture originally imagined. If I come across a secondhand copy of the CD album I purchase it and introduce it to a friend. At least a good few will appreciate it due to my efforts - I have yet to disappoint.